Posted December 21, 2015 by William Martin & filed under Headlines. BBC Worldwide has revealed details of the upcoming complete box set for the latest season of Doctor Who . 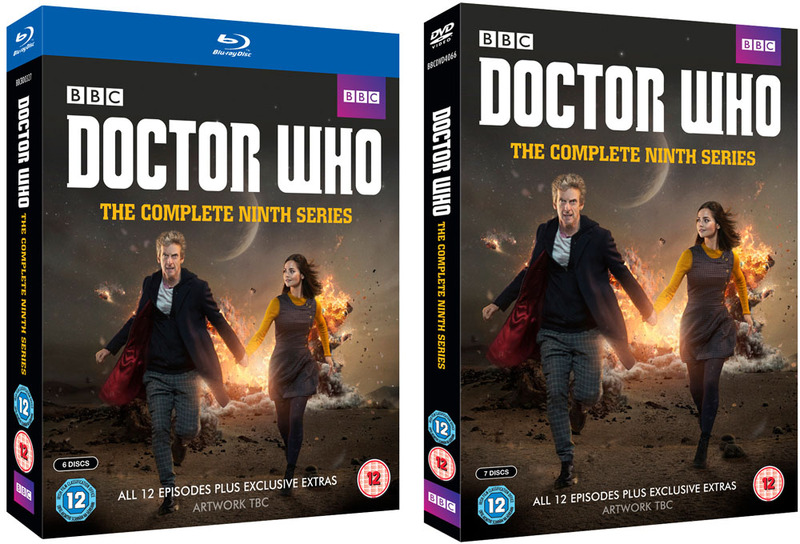 The complete ninth season will be released on Monday 7 March next year on DVD and Blu-ray. > Pre-order the box set on DVD on Amazon. > Pre-order the box set on Blu-ray on Amazon. The set will contain all 12 episodes from Peter Capaldi’s second season as the Doctor, plus 2014’s Christmas special ‘Last Christmas’ and this year’s festive episode ‘The Husbands of River Song’, with more than four hours’ worth of bonus features. On ‘Under the Lake’ and ‘Before the Flood’ (with actor Sophie Stone, writer Toby Whithouse, producer Derek Ritchie), ‘The Woman Who Lived ‘ with (actor Maisie Williams, producer Derek Ritchie) and ‘Sleep No More’ (with actor Reece Shearsmith, writer Mark Gatiss). Join Alex Kingston and Steven Moffat as we look forward to River’s return in ‘The Husbands of River Song’. Find out how River’s character came to be created, why Alex just had to play the role, what happened when the cast discovered who River really is. Narrated by Nina Toussaint-White. Wow – these are probably the best extras we’ve ever had on a modern Who box set, plus the Christmas special – yay! Makes sense that the best series since 2005 would make the best box set. Won’t bother buying the Christmas special or Part 2 separately now as will wait to luxuriate in this little beauty! It’s a corker but what else woukd we expect after the masterpiece that series 9 has been. Lucky us! Most extras ever on a modern Who box set. Deleted scenes – at last! Commentaries!!! This is the best box set package without doubt on a modern Who box set release and a long time coming with very sub standard fare throughout RTD’s time and quite spotty even in Moffat’s. Only things that could have made it better would have been commentaries with Capaldi and Coleman on either Face the Raven or Hell Bent, but we get some excellent extras focusing on both of them including one with just Capaldi and Moffat talking about the two part opener AND a short featuring highlights of the recent convention at EXCEL. But on the whole, pretty damn amazing and well worth the wait. It does look now as though we may have a bit of a gap until series 10 but the box set will be a great way to bridge that gap along with Class and the River Song/8, Churchill and War Doctor Big Finish box sets. Was good, Sleep No More was rubbish, other episodes varied from good to very good. Will miss Jenna Coleman. This looks to be the best box set compilation since 2005. Great to see they have done series 9 proud as it was certainly the best we’ve had since the show came back. Happy they have announced that the River Song Christmas special is on it, otherwise I’d have wasted my money on buying the special by itself. Not clear if we are getting the commentary on the separate Christmas special DVD release on the box set. Looks like not which is disappointing as I wasn’t intending to buy it in addition to the box set. This is certainly the finest box set they have ever put together for modern Who. There really has been a sea change in all areas of the show and production this year and it’s great to see this reflected in the high quality of the box set. What a pity BBC publicity dropped the ball so badly at the neginning of this series. Still waiting for that Capaldi commentary track. He’s a natural and brings not just his own Who knowledge but a director’s and writer’s perspective. It would be wonderful to capture some of the great thought and insight he brings to the role on a DVD commentary track. Hell Bent or Heaven Sent would have been great choices.